Our Little Miracles: It's A Boy!! and... Another Boy!! 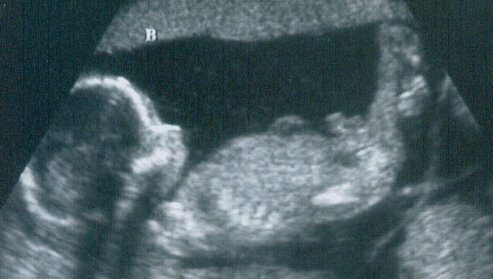 We officially know now that we have 2 boys - no doubt about it! They were not shy at all during the ultrasound! I was a little shocked because I had been thinking boy/girl for so long (oops), and Phillip, of course, is on Cloud 9. We are both very excited about our two boys and can't wait for them to get here and chase after them. We have decided to name them Phillip Hayden and Kenneth Carson - we'll call them both by their middle names. We are not sure yet, though, how to figure out who is who - but we still have some time. Finding out what the babies were was a big highlight to the day on Friday. But, for those of you wondering about the rest of the doctor visit, it went really well. I was very worried that I would be told that I had gained too much weight (because I had gained double what I had gained the month before). But, to my surprise, the doctor said that I was doing well and that I was about where I should be with twins - very nice to hear. However, I do still need to watch what I eat because it is SO easy to eat too much and eat the wrong things! I guess that happens anytime, but especially now that I am pregnant. Hayden and Carson are exactly where they need to be growth-wise. I don't think they told us how long they were, but I do know that one weighs 8 ounces and one weighs 9 ounces. That makes me feel good because being twins, I was afraid they would get behind, which I guess can still happen. But for now, they are doing great! And boy can they move! 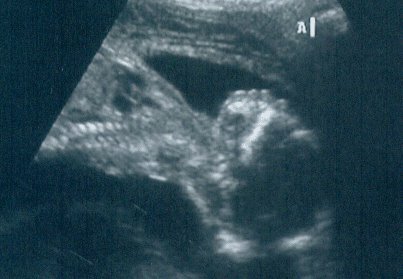 I don't really feel it yet, but watching them on the ultrasound was really neat because they were almost constantly kicking and punching. They were even kicking and punching each other - I guess there is more of that coming :). Well, that is about all for this post. Please check back for further updates. Congratulations!!! 2 Boys!! That is exciting. I am sure you guys are thrilled. Finally some twin boys at church! Well, we were also surprised but in a wonderful way. We're thrilled to be getting two grandsons. Just reading their names..Hayden & Carson makes us that much more anxious to meet them and get to know them. Let the fun begin! Congratulations! I guess someone had to have some boys eventually. I hope I get to come up & see you & everyone else soon. I was hoping to come this weekend, but we too much to do on the house still.